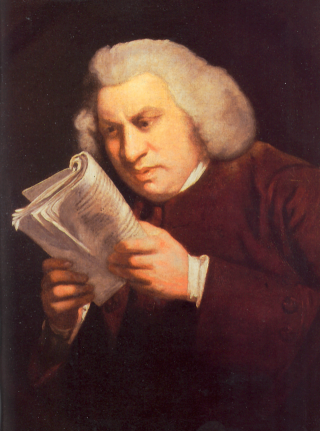 Samuel Johnson (1709-1784) was the most famous literary figure of his period. He was a popular writer of journalism and of a widely-read work of fiction; a significant poet; an astute critic and editor; a theorist and practitioner of biography; and the author of the first useful dictionary of the English language. He also wrote a play–a verse tragedy called Irene (1749)–which was moderately successful on the stage but has never been much loved by readers or critics. And he wrote an account of a long trip he took to the Hebrides, A Journey to the Western Islands of Scotland (1773). He edited the works of Shakespeare and, late in life, provided critical introductions to a multivolume collection of works by English poets. In the range of his accomplishments and the kinds of influence he exerted in many different forms there is no one else quite like Samuel Johnson in the history of English literature. Johnson became famous in his own time after the publication of the Dictionary of the English Language in 1755, hailed as “Dictionary Johnson” for accomplishing something that had seemed to many to be impossible. After his death, his personality as it was remembered by others often began to eclipse his writing, particularly after James Boswell published The Life of Samuel Johnson in 1791, a massive biography that was constructed in large part out of the extensive journals that Boswell kept based on the time that he spent together with Johnson starting in the 1760s. The image of “Dr. Johnson” that Boswell created, an argumentative talker and a staunch conservative, dominated the public and to a large extent the critical image of Johnson. But in the last few decades, critics and readers have returned to Johnson’s works, discovering the astonishing range of his interests and skills. And that’s appropriate: before he was an icon of a certain way of thinking about the eighteenth century, Johnson was a writer, working in almost all of the forms available to a writer in his period. This anthology is designed to help students and readers go back to his writings and understand them in the context of their moment. The Open Anthology of Literature in English is licensed under a Creative Commons Attribution-NonCommercial 4.0 International License.